[caption] Cross section of typical wing dam. Note alternate layers of brush and stone. Those piles of stone and brush in the river, known as wing dams, are both cursed and praised by many a recreation boater. Lurking beneath the water near propeller depth, thousands of these jetties are located along the mainstem of the river. They focus the flow of the water to develop a deeper, narrower main channel to aid commercial navigation. 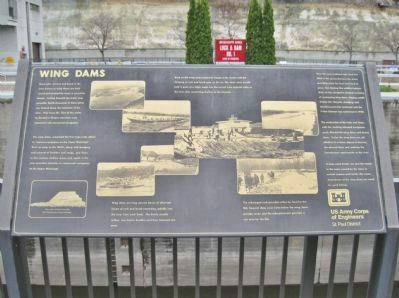 The wing dams comprised the first large scale efforts to improve navigation on the Upper Mississippi River as early as the 1860's, along with dredging and removal of boulders and snags. Low flows in late summer, shallow areas, and rapids in the river provided obstacles to commercial navigation on the Upper Mississippi. Wing dams are long narrow berms of alternate layers of rock and brush extending radially into the river from each bank. The brush, usually willow, was tied in bundles and then fastened into mats. Work on the wing dams commonly began in the winter with the dumping of rock and brush mats on the ice. The dams were usually built in pairs at a slight angle into the current from opposite sides of the river, thus constricting the flow of the channel. submerged rock provides niches for food for the fish; frequent deep scour holes below the wing dams provide cover; and the reduced current provides a rest area for the fish. Over the years sediment and sand has filled in the spaces between the dams, providing areas for trees and brush to grow, thus forming fine wildlife habitats. Work on the navigation channel consisting of constructing wing dams, digging cutoffs, closing side channels, dredging, and shoreline protection continued until the 9-Foot Channel was authorized in 1930. The construction of the locks and dams, with the resulting elevated navigation pools, flooded the wing dams and closing dams. 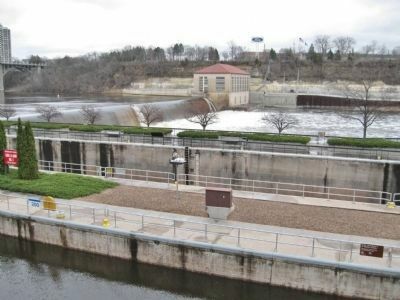 Today the wing dams are still effective to a lesser degree in focusing the channel flows and reducing the maintenance requirements on the river. A keen-eyed boater can spot the ripples in the water caused by the dams at normal summer pool levels. The areas downstream of the wing dams are noted for good fishing. Erected by US Army Corps of Engineers, St. Paul District. The marker is along the riverward lock. Lock and Dam No. 1. Marker is at or near this postal address: 5000 West River Parkway, Minneapolis MN 55417, United States of America. Touch for directions. Other nearby markers. At least 8 other markers are within walking distance of this marker. 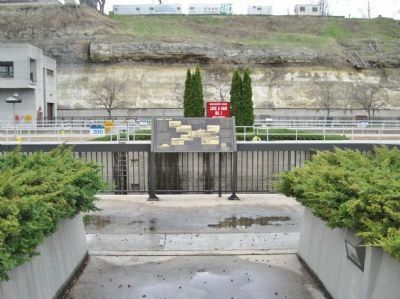 Big Water / Stairway of Water (within shouting distance of this marker); The Lock and Dam No. 1 Story (about 300 feet away, measured in a direct line); Hydro Electric Turbine (approx. 0.2 miles away); 3 – Master Map (approx. 0.3 miles away); 1–Main Entrance Minnehaha Lower Glen (approx. 0.3 miles away); Geology of Minnesota (approx. 0.4 miles away); Gunnar Wennerberg (approx. 0.4 miles away); John Harrington Stevens House (approx. 0.4 miles away). Touch for a list and map of all markers in Minneapolis. More. Search the internet for Wing Dams. Credits. This page was last revised on March 18, 2019. This page originally submitted on December 2, 2011, by Keith L of Wisconsin Rapids, Wisconsin. This page has been viewed 876 times since then and 10 times this year. Last updated on March 16, 2019, by McGhiever of St Paul, Minnesota. Photos: 1, 2, 3. submitted on December 2, 2011, by Keith L of Wisconsin Rapids, Wisconsin. • Bill Pfingsten was the editor who published this page.